A properly designed and fitted pedestal is essential for any serious boater—solo or tandem—who paddles Class III whitewater and beyond. Mike Yee’s shorter and wider pedestal outperforms the longer, thwart-mounted narrow saddles found in many boats. The difference? Longer, narrower saddles are usually bordered on the front and back by float bags, creating a water dam in the boat. The Mike Yee Pedestal allows water to travel freely in the boat, making it much more stable on the river and much easier to roll. 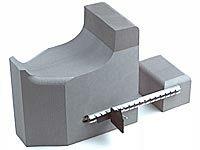 The Pedestal is made of closed mini-cell foam, is 8" wide for maximum comfort and stability, and is available in two heights, 8" & 10" (custom heights are available for an extra charge). It has a separate foot brace mounting block at the rear of the pedestal that allows water to flow freely and a raised lip on the front edge that prevents the boat from slipping off your shoulder when portaging. Yakima Foot Braces are recessed and securely mounted on plastic dowels. For paddlers over 210lbs or those who need a larger seat base.